Take It Make It July Challenge: Winners! We are so pleased to announce the winners of our July Challenge: Take A Stamp! We loved this amazing 3D creation! So much detail, all the elements work so wonderfully well together! 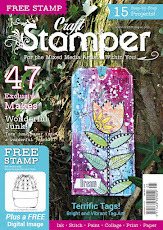 Anne will win a Guest Designer slot here on the blog, her very own Winners Profile, and of course her amazing art will be featured in it's own 2 page spread in Craft Stamper magazine! Congrats Anne! The prize on offer for our randomly selected winner is this bundle of goodies! We have... 3 aperture ATB kits, 4 beach/nautical mini shape sheets, a seashell frame ATC blank, a nautical shrine kit. Congrats Autumn, we hope you create some fabulous art with the Calico Craft Parts! Top Four Design Winners, also please contact me if you wish to receive a button to display on your blog. Our August challenge will be launched next Friday, August 5th! Reader Submissions wanted: Ready Set Stamp! 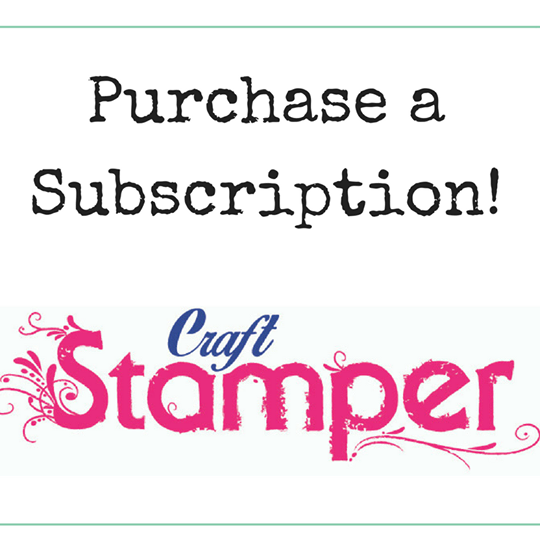 We are looking for submissions for our Ready, Set, Stamp feature on the following theme for our December issue of Craft Stamper. If you've always wanted to see YOUR card in print, now is your chance!!
. NEW work only please, we do not accept cards that have been published elsewhere before submission. . Please do not use stamps that are discontinued for this article. As July has five Fridays, we have a extra Friday to spare with no Blog Challenge posts! We decided to share a little more of one of the fabulous projects featured in our August issue today with you all. Lousie Crosbie created this simply STUNNING altered box..
A fabulous steampunk inspired piece, the outside is created from layers of aluminium tape, with DecoArt liquid glass dots as rivets. After many layers of alcohol inks, paints and patina finishes, the end result is a superb take on a steampunk submarine! Through the porthole, you can glimpse an undersea world, created with fusible film and lots of MDF embellishments. As space was limited in the magazine, we couldn't really explore that world... until now! The intricate, layered, fabulously coloured world can be seen! "The inside of the box was painted blue before building up layers of fusible film and fibres. I used a gel medium to hold the film, then heated with a heat gun until it melted and holes appeared. The gel keeps the film attached in places. I added shells, glitter, beads and gems to enhance the deep sea world. 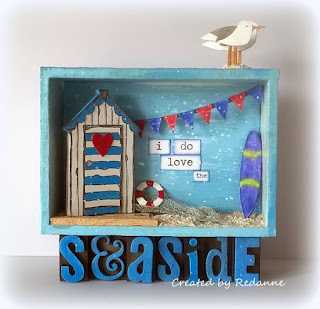 I added Calico Craft Parts flourishes to create the ocean waves and other nautical themed embellishments to set the scene"
The level of detail in this piece is simply astonishing, we love it! Christmas in July?! Art Call! The readers gallery we featured in the August issue has proved very popular... so we thought we would have another one! Any kind of seasonal ornament, but it must be able to be hung up somehow, and it must also feature stamping somewhere! Other than that, you are free to create in any style and in any colours you wish! The Art Call will be open until FRIDAY 19TH AUGUST 2016. We will not consider, or choose any entry for publication until Monday 22nd August 2016, and will email all entrants chosen on this date. If you do not receive an email on the 22nd, then unfortunately you have not been chosen. We do not accept projects created with digital images ONLY for this feature. Digital images are welcome, but must be used in conjunction with rubber/polymer stamping to qualify. Projects which are selected need to be posted to the Craft Stamper offices in the UK, as soon as possible after August 22nd. You may enter as many different ornaments as you wish. However, each entry MUST be in a separate email. Projects will be returned at our expense, along with a complimentary copy of the magazine in which your project features once it has been published. Text for this article is required (it's very short!) 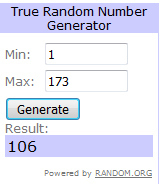 and should be entered into the document provided – this will be sent to you if you are selected. Help can be given with this if needed! Please take a clear photo of your entry, and send it to: cs@traplet.com with the words 'Ornament Art Call' in the subject header. We are so looking forward to looking at all of your amazing creations! Avril won the challenge with this amazing card! We loved thewonderful layering effect of the flowers, and we thought the elegant colour scheme was fabulous! A: I have been stamping for about 7 years. It started when a friend asked me to go to a card class, reluctantly I said 'yes'! I didn't think rubber stamping was my thing – how wrong could I be! A: I have a wide variety of stamps and I do love Vintage. I have more Tim Holtz and Artistic Outpost stamps, so I think they must be my favourite! A: I'm definitely a messy kind of stamper and love messing about with backgrounds and inks. A: I do tend to veer towards Vintage and Feminine, but I do like to try different styles as it's easy to get into a comfort zone and not explore different possibilities. A: If it was only one product I couldn't do without inks, but stencils come a very close second. Congratulations Avril on being our June Design Winner, and it was lovely to learn a little more about you! Our current challenge 'Take A Stamp : ANYTHING GOES" is open for another 10 days or so! Don't forget the fabulous prize, a big bundle of MDF substrates from Calico Craft Parts. As July has 5 weeks, next Friday's post will be a special one, featuring some amazing unseen details from a magazine project! See you then! Show us how unique you can be, create anything your imagination cares to dream up! Share your cards, journal pages, layouts, 3D assemblage or whatever else takes your fancy. Your project can be any colour you want... as long as you've stamped somewhere, then you're good to go! Calico Craft Parts stock an ENORMOUS range of laser cut MDF and chipboard shapes. From the brand new range of houses, through ATB cube kits and lots and lots of flora, fauna , seaside and seasonal shapes, there are simply too many products to mention! Lots of wonderful substrates for all you mixed media people to get creative with, and also plenty for those looking for a simple embellishment for a CAS card! Please remember... to be eligible for either prize, you need to include a link back to the Craft Stamper blog, and also... just put ONE project into your blog post! Welcome to the Craft Stamper July Take It, Make It challenge! -just remember to add stamping in there somewhere!